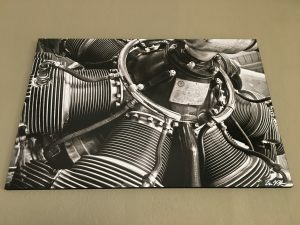 I have been privileged over the last couple of years to have coffee and breakfast several times with the “Knights of the Round Engine Table.” They meet in the Silver Wings Bar at the Best Western Thunderbird Suites, across from the construction where Scottsdale Airport Terminal used to be. 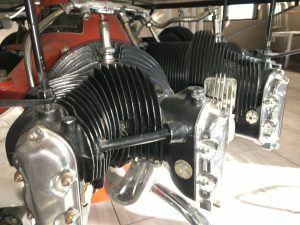 The Knights’ moniker derives from the glass-topped bar table which has as its base an old 9-cylinder Continental radial aircraft engine. A small group of pilot-friends gathered around the old engine a few years ago for monthly breakfast and war stories. 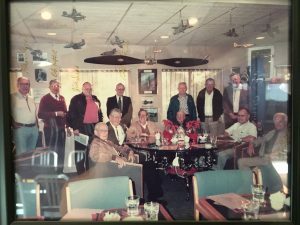 The original group was comprised of the builder of Thunderbird Suites, Bill Arthur (USAAC, ANG), Bill Bullock, Jim Dias, Joe Foss (USMC ace); Ole Griffith (USAAC/USAF); Al Grimm, and Hal Hazel. They all had some flying time in radial-engine aircraft, thus it wasn’t too much of a stretch for them to “knight” themselves with a title appropriate to the venue. Other friends and fellow pilots were eventually invited to participate. 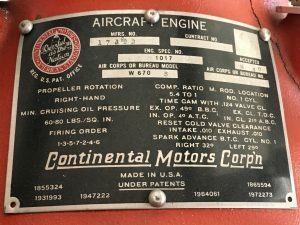 The general requirement of round-engine flight time was graciously relaxed for the occasional jet jockey, flight crewman, or aviation enthusiast. 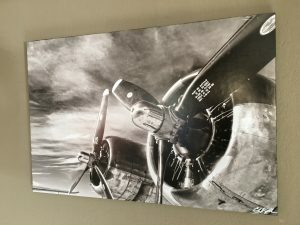 At some point the war stories became a little more ‘structured,’ and aviators from history were chosen as topics of discussion for each meeting. 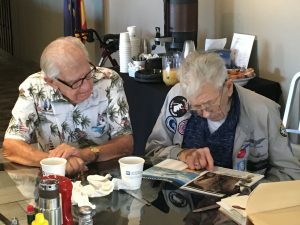 At one of the meetings last year, the topic was “The Wright Brothers.” As it happens, Ole Griffith (the only surviving member of the original Knights) actually met Orville Wright during his flying career. In the photo above, Ole is reading to the Knights about WWI ace, Eddie Rickenbacker, as his friend Don Wolf looks on. Don drove a tank in General George S. Patton‘s fast-moving Third Army in relieving Bastogne during the Battle of the Bulge, and he personally captured and disarmed the SS commandant of one of the Buchenwald sub-camps, who was skulking away at the end of the war. Unofficial chairman of the group at the time I started attending was Major General Carl Schneider (USAF, retired). General Schneider moved away last year, and handed the reins over to aviation historian Arv Schultz. See also the Veteran’s Heritage Project.